Well, we’ve been running the Cambridge Academy for about six months now. Cambridge Academy (see previous write-up here): so far so good. We’ve run into some problems and changed course a couple of times, but the program is shaping up and it’s time for a big recruitment push. In this post I will talk about some hiccups we encountered, solutions, and future plans. 1. We continue to buy books and process existing ones (label and put into database and reading checklists) so that students can use them. We’ve probably doubled our existing readers since April and will probably continue doing this for the foreseeable future. Practice is making better, and our processing is getting much quicker now. open box, remove plastic wrapping etc. The two major problems are if books don’t have YL/word count information, and if books don’t have CDs/audio. Right now we guesstimate YL and count words if the books are short enough. For longer books we try to find the word counts online. This site is great to find US-published series. 2. 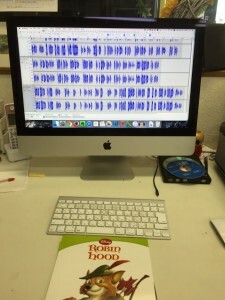 For books with no commercial audio available, we have been making our own by reading the books out loud into an iMac using Audacity to produce mp3 files that we then burn to CDs using iTunes. So far this is working very well, but it takes quite a long time and we still have over 500 books to make CDs for! 3. None of our students have gone beyond YL1.0 yet, but a couple of them will reach it soon. Before that happens we need to make sure we have enough books for them to read. Another problem is what to do about audio. I suspect that by the time students go over YL1.0 audio will be less important, but I am not 100% sure. 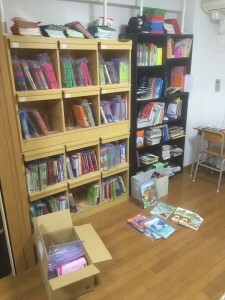 The other question is whether to continue grouping books into sets or to move to having individual books. If individual books, what will the checklists look like? I suspect all of this will get worked out over the next six months or so. 4. We have two problems with some of our students. The first is that a small number of students (two or three) seem to be exaggerating the amount they read or reading in a very perfunctory way (just looking at the pictures). I’m not sure how much of a problem this is, as they may well still be getting some benefit from the audio input. If it is a problem, I don’t really know what to do about it. I have tried talking to them, asking them about the content of books, and had them read the books out loud to me, but I am still not happy about the situation. Work in progress. The other problem is potentially more serious. So far only one student seems to have run into it. Basically the student seems to have hit a wall around YL0.3, and is reporting that they cannot understand anything in the books at that level. I have tried talking to the student and explaining that it’s not necessary to understand everything but rather important to try and catch familiar words and think about the meaning, but I am not sure how helpful that was or how to solve this if it comes up with other students. Another work in progress. 5. 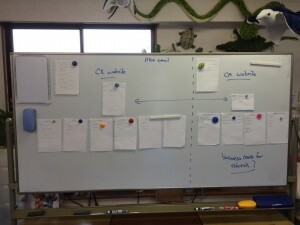 Our initial model bundled extensive reading and writing practice (through weekly writing assignments) into one class, with speaking activities in the other. However, this model has several important drawbacks and we’ll be changing it in the future. Our ER classes have up to 12 students in them, so checking each student’s writing in 55 minutes is really hard and quite stressful for the teacher. Checking writing assignments in the ER class also means that our teaching assistants cannot take the class (they would be able to if it was just ER). Finally, having writing assignments in the ER class makes the class more stressful and less fun. Students are worried about finishing their writing instead of just relaxing and enjoying the reading class. From next year we will include the writing assignments in the communication class (output), while the ER class will focus on reading and listening to the accompanying CDs. We have a few plans not mentioned above. The first and most important is that now that the program is getting into a half-decent shape, it’s time to try to expand it and recruit more students. So far all our students joined from within the school. Only half a dozen or so joined the school once the Academy was running, and we haven’t been actively advertising the course. From this week we will start actively trying to recruit new students, through our new Academy webpage and various advertising campaigns. Our goal is to have 100 students in the Academy by December 15th this year. Our website is getting a bit dated so we plan to get a new one made in November this year. We are also going to explore whether the ER class is a standalone product. At first we went off the SEG model, which pairs an ER class with a communication class, but my friend DE suggested that the ER class might be our main product, with the communication class as an optional extra. This would be much easier to provide logistically, so I am excited to see if it is true over the next couple of months. Another thing that we need to work on is making the ER classroom more comfortable. Right now it is set up with school-style desks and chairs, but we are planning to make more of a cafe-style with more comfortable chairs and funkier design/lighting/etc. Ideally it should be a welcoming space that students want to spend time in, and prospective students are attracted to. Work in progress, but I hope to post some pictures in the next update. We need to find another couple of teaching assistants so we can train them before expanding the number of classes. We’re looking for 2nd-year university students at the moment. Eventually we are hoping to open new branches in other parts of the city. I think that will be an option once we have 200 students at the original location. Another work in progress! Any questions or advice? Please comment below. Thank so much for posting this, Ben. I couldn’t quite figure out the SEG label thing by clicking on the link. Is that some part of a cataloging system? Is there somewhere I could find out more? Thanks for stopping by! The labels are just simple pre-printed sticker labels (series/YL/word count) sold in sets of 600. You can buy them in the SEG bookstore. We met at Oxford Day in Taiwan last May. Really interesting to read about this. A colleague and I are considering launching something similar here in Taiwan as an alternative to the omnipresent cram schools that focus on reviewing students’ classroom material. Hard to know if a market exists or not. Good luck with your efforts! There is also a large (in terms of language schools) capital investment before you start. 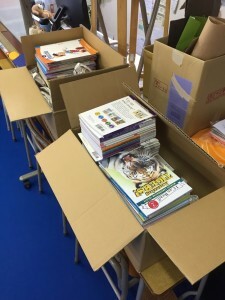 We had most of the books, but if you had to buy them from scratch you are looking at a lot of money, regardless of how many students you have. Be happy to chat if you get any closer to starting. Thanks for the prompt reply. Yeah, as we get closer I’m sure I’ll have more to pick your brain about. Best! This model will become easier to implement when more materials are available in digital format, books with audio on computers or tablets. Of course there is debate about reading on paper vs tablets computers, but wouldn’t a Raz kids type of system be well suited to this model? I use Raz-kids with some elementary school students, and think XReading has a lot of potential, but for now I am really liking the paper and CD version. For me, the main issues are amount of screen time, difficulty of monitoring what students are doing on devices, and the variety of materials. I (and many parents) don’t want to ask students to spend even more time using smartphones, I can’t really tell what students are doing on smartphones in class, and there are nowhere near as many books online as there are paper ones. As a business, the barrier to entry provided by paper books is quite nice too, as is the ‘library’ image we project to current and potential students. I haven’t seen any ER programs using online only, so would be really interested in checking one out. Let me know if you know of any! Glad to get an update of your ER program. I had some thoughts about the students who are not thriving in the environment. I have found that there is a small group of students who are excessive perfectionists and have a much harder time with English when taken out of the explicit grammar environment and asked to use intuition instead. They can feel a lot of anxiety when ESL texts (with more idioms and turns of phrases) are thrown at them. It is as if they need teacher-led sessions to clearly define phrases that can not be decoded directly (for example, with translation software). This, of course, is not really what ER is all about. Maybe they will have to read a lot more at lower levels before progressing…Not sure about the solution. As for the other student who is not reading earnestly, I might wonder if either he has a reading issue like dyslexia that is making his progress harder (since you say he might be enjoying the CDs) or he simply lacks internal drive (a difficult innate character trait that can not be helped too much). If he is dyslexic, then extensive listening is really important for him. If he lacks drive, I am not sure that ER will work for him. I find that these kinds of kids need an external force like a parent or teacher to help create goals and expectations, and follow up to see if the checklist is being achieved. I like the ziplock bag idea for storage of cds. I was just thinking this morning, however, about whether my library was outdated with cds, and if there would be some better way to get all the cds in mp3 format on the Internet so that they could be downloaded to iphones/notepads etc. That way, the library storage would just have the books. We currently put books and cds in cases together with elastic cording. The cording lasts for two or three years before we have to replace them. That sounds exactly like our student who hit the wall! Very uptight and unwilling to step out of their tightly-defined comfort zone. I agree that reading a lot more at lower levels might help, but we don’t have many books they haven’t read… hmmm. Another tough one. I had the same idea of putting all the audio online, then using QR codes to allow the students to play it on smartphones or tablets. Two problems: bandwidth and control. I don’t think our network can handle 12 people streaming at the same time, and if they use their own data plans we’ll run them down. Also, I can’t tell what students are doing on their own devices, whereas if they are using a portable CD player there are only two things they could be doing (listening or not listening). This is something I might come back to in the future, if I can find a better tech solution. Right now it’s not a priority. I’m assuming you didn’t and the book was just for show. PS: The manual on PDR arrived yesterday. Thanks for much. I’m looking forward to reading it over Golden Week. Ha ha, yes. Actually, we were splicing the audio together. The Penguin/Pearson Kids audio is in page sections, but we prefer one continuous track for our students, so we use Audacity to splice the tracks together. 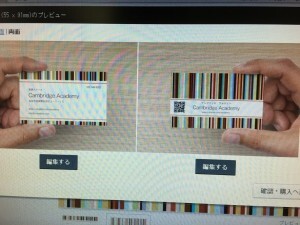 Let me know if you have any questions about PDR.